If you need a company that can support your HP Z210 Workstation than you have come to the right place. On Queue Computer has been supporting legacy workstations just like the Z210 for over 25 years. 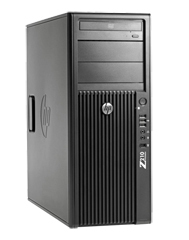 We have inventory for all of the HP Z-series workstation line and we are technically adept to help you in your needs. The new HP Z210 Workstations give you workstation-class performance and reliability with faster Xeon processors, ECC memory, professional graphics, enterprise-class storage and application certification at a very appealing price point. The HP Z210 Workstations offer up to a 20% performance improvement over the predecessor series products. On Queue Computer has been an industry leader in the legacy HP market for over 25 years. No matter your needs you can be sure that On Queue Computer has the experience to help you. For high quality HP Z210 workstations with a one year warranty please Request a Quote or contact us directly at (978) 499 0049. We supply all Z210 components and parts including system boards, power supplies, fans, disk drives, memory, cd/dvd roms, and I/O boards.